Lilongwe is the capital of Malawi and after Blantyre in the south it is the second largest city in the country with about 700,000 inhabitants. It is located in the central part of the country along the Lilongwe River, not far from the borders with Zambia and Mozambique. It is the administrative and political centre of the country, but Blantyre is of more importance regarding the economical position. The city is very safe compared to many other African capitals and as a result many expats, some of them working for NGOs, live here and for travellers the city is a welcome place as well with good infrastructure, hotels, bars and restaurants. Old Town is where the majority of the accommodation and shops can be found, as well as the bus station. City Centre is where most embassies can be found, in particular the Mozambique High Commission. Lilongwe wildlife centre is located on the opposite side of the road to the old nature sanctuary. Its back down towards old town by the bridge over the river, look out for the sign. Its a wildlife rescue and rehabilitation centre that provides excellent tours of the centre and its wilderness zone, a wide range of wildlife and good value for money. At Kumbali Cultural Centre you can see the traditional Malawian dancing and traditional Malawian drumming. Includes live acoustic Malawian music and traditional Malawian dinner. Lilongwe has a tropical climate with usually hot and humid weather, especially during the rainy period from November to April. From May to October it is rather dry and dusty, with the late dry season being the hottest time of the year, with temperatures usually well above 30 °C during the day. June and July can be relatively cold though, with night temperatures regularly dropping below 10 °C at night, rising just above 20 °C during daytime. If you are heading to Mozambique, then some crossings will require you to have obtained a visa in advance (in any case, getting it in advance should preclude the possibility of the border officials accidentally/deliberately overcharging you). Note that the date of entry you specify is the beginning of a TWO month period in which you must use your visa. If you hand in your passport in the morning then you can pick it up again in the afternoon. Directions to the Mozambique High Commission are given in the Getting Around/By Public Transport section. Air Malawi is the national airline of Malawi and from Lilongwe International Airport (LLW) near the capital there are flights to and from Harare, Johannesburg, Lusaka and Nairobi with Air Malawi. Air Zimbabwe flies to and from Dar Es Salaam, Dubai, Harare and London. Addis Ababa, Nairobi and Johannesburg are served by their respective national airlines. Air Malawi also flies into the city from Mzuzu and Blantyre. Lilongwe is about 110 kilometers from Mchinji on the Zambian border. 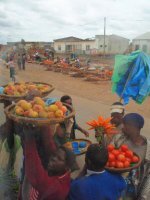 Taxis are expensive (around $50, depending on your bargaining skills), but you can use a minibus or open back truck (matola) for MK500/600. There are several AXA buses per day from Mzuzu to Lilongwe, taking 6.5 hours. These arrive in Lilongwe at the bus terminal south of Old Town - a taxi from this bus station to Old Town is available. There are several AXA buses per day from Lilongwe to Blantyre, taking 4.5 hours. These leave from the AXA terminal on Murray Road in Old Town. Taxis within Lilongwe are cheap. You can pick up taxis from the Lilongwe Hotel (in the Old Town) and the Capital Hotel (in the Capital City). The town is very spread out so getting around can be a bit of a chore. If you're feeling adventurous, you can take a minibus. It's very cheap, but you will be getting very familiar with your fellow passengers. There are several routes you can take, including one that goes from the large blue bank in the new town and drops you off in the heart of the old town, next to Shoprite supermarket. Old Town is compact enough to cover on foot. There are many local cafes, especially in Area 2, serving cheap meals such as rice/chicken/nsmia/beef. Shoprite and Spar also have deli counters with hot food, sandwiches and a bakery. Drinking is a lot of locals favourite past times, most are friendly however girls should be wary of over-protective Malawian men! The only beer brewed in Malawi (bar Chibuku - a grainy, sand like beer coming in cartons!) is Carlsberg. Carlsberg is very local (brewed in Blantyre) and comes either normal (known as a 'Green') or Special Brew, Classic, Stout, Elephant or Light. You can also buy 'Kuche Kuche' - still brewed by Carlsberg but coming in a bigger bottle, less percentage and aimed more for tourists. Glass bottles come in a deposit form in Malawi (so expect to pay MK25 extra per bottle, unless you return some). It is possible to buy other beers in certain bars and clubs - for example Castle, Carling Black Label, Kronenbourg and Heineken. However these are more expensive. Ciders and wines also are available but are imported and more expensive. Malawi also has it's own spirits - notably Malawi Vodka, Malawi Gin (surprisingly this is very good quality gin! ), Malawi Rum, Gold Label Brandy or the upmarket Premium Brandy and the cane spirit Powers. These are all cheap spirits per bottle, Powers and Gold Label Brandy normally MK600 a bottle. Mixing with the sugary, very tasty Fanta always works and you see many locals doing this! The Vodka, Gin and Powers can also all be bought in 30ml sachet forms. Harry's Bar, in the old town, is a good place to have a drink and a burger during the day or to slam Malawi gin and tonic with an energetic local and expat crowd on weekend nights. More of a pre-drink place. If you're interested in volunteering with animals,the LSPCA (Lilongwe Society for the Protection & Care of Animals) takes volunteers from various backgrounds including veterinary, IT, marketing and animal care/management. The volunteer programme is an affordable with a minimal commitment of 2 weeks required. With a shortage of vets available to the majority of Lilongwe's residents, the LSPCA undertakes vital work in Lilongwe in helping to promote higher animal welfare standards of domestic and farm animals. As a volunteer, your work would include visiting local schools to educate them about the importance of animal health and care, community vaccination clinics (rabies and Newcastle disease), spay and neuter clinics, and farm day clinics. We have a comprehensive list of accommodation in Lilongwe searchable right here on Travellerspoint. You can use our map to quickly compare budget, mid-range or top of the range accommodation in Lilongwe and areas nearby. This is version 20. Last edited at 3:17 on Aug 2, 17 by sleepBot. 18 articles link to this page.